February 2016 53 experiences, formal seasonal plantings, and geological artifact tied to the celestial sky. 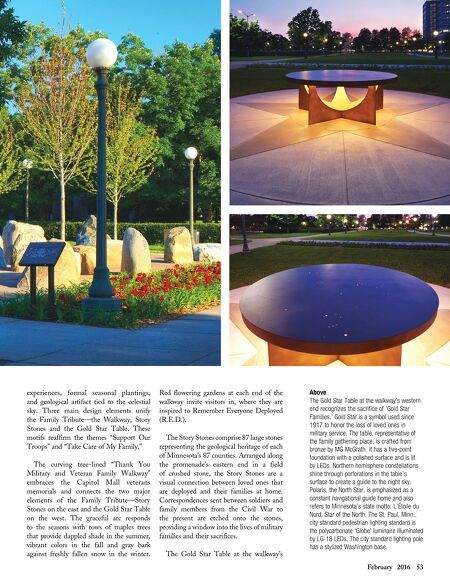 Three main design elements unify the Family Tribute—the Walkway, Story Stones and the Gold Star Table. These motifs reaffirm the themes "Support Our Troops" and "Take Care of My Family." The curving tree-lined "Thank You Military and Veteran Family Walkway" embraces the Capitol Mall veterans memorials and connects the two major elements of the Family Tribute—Story Stones on the east and the Gold Star Table on the west. The graceful arc responds to the seasons with rows of maples trees that provide dappled shade in the summer, vibrant colors in the fall and gray bark against freshly fallen snow in the winter. Red flowering gardens at each end of the walkway invite visitors in, where they are inspired to Remember Everyone Deployed (R.E.D.). 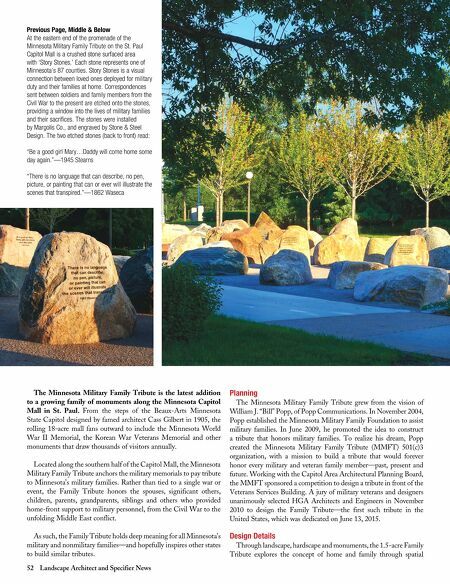 The Story Stones comprise 87 large stones representing the geological heritage of each of Minnesota's 87 counties. Arranged along the promenade's eastern end in a field of crushed stone, the Story Stones are a visual connection between loved ones that are deployed and their families at home. Correspondences sent between soldiers and family members from the Civil War to the present are etched onto the stones, providing a window into the lives of military families and their sacrifices. The Gold Star Table at the walkway's Above The Gold Star Table at the walkway's western end recognizes the sacrifice of 'Gold Star Families.' Gold Star is a symbol used since 1917 to honor the loss of loved ones in military service. The table, representative of the family gathering place, is crafted from bronze by MG McGrath. It has a five-point foundation with a polished surface and is lit by LEDs. Northern hemisphere constellations shine through perforations in the table's surface to create a guide to the night sky. Polaris, the North Star, is emphasized as a constant navigational guide home and also refers to Minnesota's state motto: L'Étoile du Nord, Star of the North. The St. Paul, Minn., city standard pedestrian lighting standard is the polycarbonate 'Globe' luminaire illuminated by LG-18 LEDs. The city standard lighting pole has a stylized Washington base.